What’s in a word? I know many people consider it a fad or a buzzword, but the word missional represents a vital concept if you want to be a faithful and fruitful congregation doing the work we were commissioned by Christ to do. For years mission was considered to be something you did in another culture and away from your local setting in ministry. And many churches poured most of their benevolent dollars and a ton of prayers into the salvation of people far away in another part of the planet. The unfortunate by-product in our local congregations is that when they were “on mission” in India, they could justify focusing on maintenance at home. Where missionaries were hired to save the lost in distant lands, we could justify spending more money on furnaces and hymnbooks at home than on local outreach and evangelism. It was possible to become holy huddles, small groups circled inward knee to knee with their backs turned away from their unchurched and unsaved neighbors across the street. The rest was that churches found themselves increasingly in communities that were totally or largely disconnected from Christ. In other words, pagan communities. People were coming to Jesus by the thousands in China and South Africa and people were headed to hell in Harrisburg and Lancaster, Frederick and Carlisle. Churches could only report 1-2 new converts per year and yet claim to have 200+ members. 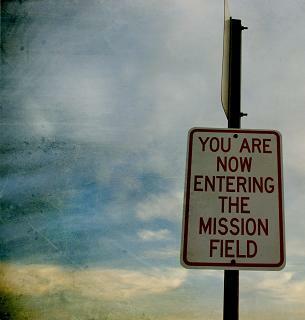 The mission field of your church begins at you front door. In some cases, if you are not too closed or exclusive, it might even begin within your sanctuary. That means you never set foot into the community when you are not on mission and called to be a missionary.